In our rapidly changing world of social media, everyday people are more and more able to sort themselves into affinity groups based on finer and finer criteria. 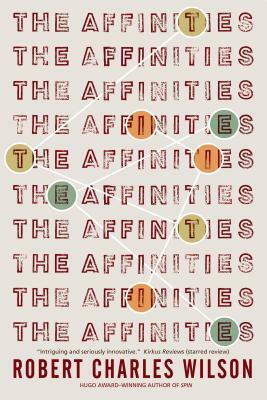 In the near future of Robert Charles Wilson's The Affinities, this process is supercharged by new analytic technologies--genetic, brain-mapping, and behavioral. To join one of the twenty-two Affinities is to change one's life. Young Adam Fisk takes the suite of tests to see if he qualifies for any of the Affinities and finds that he's a match for Tau, one of the largest. Joining Tau is utopian--at first. Problems in all areas of Adam's life begin to simply sort themselves out as he becomes part of a worldwide network of people dedicated to helping one another--to helping him. But there are other Affinities than Tau, with differing skills, strengths, and views about what to do with their newfound powers. As all twenty-two Affinities go global, they rapidly chip away at the power of governments, of corporations, of all the institutions of the old world. Then, with dreadful inevitability, the Affinities begin to go to war--with one another. For Adam, and for the world, human life will never be the same.